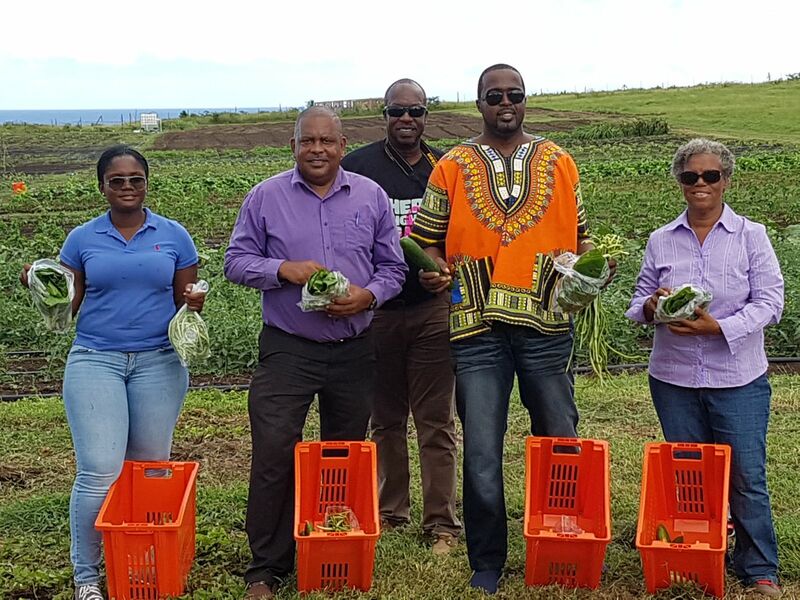 Oranjestad- The focus of the PLP/Merkman government to achieve more local production and a greater degree of self-sufficiency is starting to pay off with the first harvest of various vegetables by Made in Statia. Some of the produce harvested this past week were spinach,cucumbers, string beans and bok choy. According to commisioner Charles Woodley, the available new vegetables are a product of local Government’s push towards more agriculture and more self sufficiency. “Government has as one of its focal points that St. Eustatius be more self sufficient when it comes to producing it’s own food”, said commissioner Woodley. According to Woodley, initiatives in the sector of agriculture have been actively supported by government. Woodley also told the BES-Reporter that government’s aim is to create at least 50 – 75 jobs in local agriculture. According to Woodley, at the beginning of the program there was only one local farmer, but now there are three more farmers who are actively cultivating a range of vegetables on the island. Woodley says that government has contributed with making available the necessary ground, fencing and plowing. Money was made available from the post Integral Means. Woodley says that local agriculture serves a number of goals: local food products are cheaper, the island becomes less dependent on others, the vegetables are fresher and much needed jobs are created in the local economy. A recent report complied by Ecorys/Curconsult on request of former minister of Economic Affairs named more local production as one of the ways to combat high food prices on the islands. Seems to work on Statia. Bonaire has 50mm of absolute rubbish, then 10m of coral, then bedrock. No topsoil at all and it takes 100 years to produce 30mm of soil which promptly blows away/washes away. Meanwhile we have uncontrolled runaway development. Bring in the bulldozers, pave the planet, deforest, deforest, deforest. Sure we are planting trees but still cant keep up with the bulldozers. With any kind of farming you start with the soil or irrigation like Israel does.. We have neither. I’m not sure where you have looked on Bonaire, but here in the kunuku we have a pretty layer of topsoil. But too many iguanas (which are protected), so every vegetable you plant is just food for the iguanas. So lot off people won’t waste their time anymore to feed iguanas.